This is part three of our multi-day series on The Zombie Brain. Be sure to visit Oscillatory Thoughts tomorrow for symptom 3! As soon as zombies rise from the dead, they begin walking. Well not walking... more like lumbering. Each step is slow and arduous. Their stance is wide and steady. This presents us with a very important clue about their brains. Now a lot has been said about the origins of the zombie “walk.” Given the pervasiveness of the disease, some have argued that zombie movements are like those seen in Parkinson’s disease. Parkinson’s is a devastating neurodegenerative disorder caused by the loss of dopamine neurons in the brain that project to a group of regions collectively known as the basal ganglia. It is partly characterized by a slow decrease in the coordination and ability to move (not spastic, jerking movement as is stereotyped... that’s a side effect from the medications). However, consider this, persons afflicted with this disease will shuffle when they walk, adopting short sliding movements, and a hunched posture. Shaking and tremors are also present while patients are not moving. This does not sound like the zombie movements we see on the silver screen. Zombies can move quickly when striking and show no signs of a hunched posture or tremor. 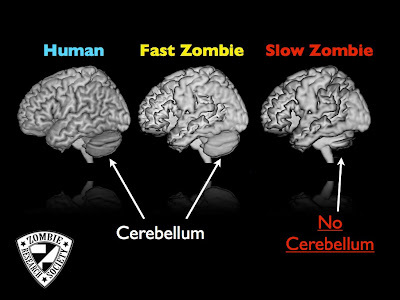 Therefore, we believe that it’s time to do away with the basal ganglia theory of zombie locomotion! The lumbering zombie walk more resembles the movements characterized by damage to an area of the brain called the cerebellum. * The cerebellum is a little cauliflower shaped region at the back and base of your brain. It is involved in many functions (e.g., learning, language, memory, sensations), however it is classically described as a motor coordination region. Indeed, this “little brain” has about half of the neurons in your entire brain! Patients with degeneration of the cerebellum exhibit a syndrome referred to as spinocerebellar ataxia, which is characterized by uncoordinated movements of many kinds, including a wide-stance and lumbering walk. 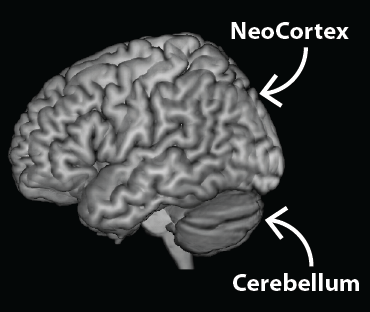 Although patients with cerebellar ataxia exhibit many coordination problems, the symptoms are alleviated somewhat with the assistance of vision. This may be another important clue about the zombie brain. Thus, we contend that zombies suffer from a severe spinocerebellar ataxia. Well, the “slow zombies” do, at least. What about fast zombies? Given the terrifyingly coordinated movements that “fast zombies” exhibit (think 28 Days Later or the recent remake of Dawn of the Dead) their cerebellums are likely intact. Thus we can also begin to develop neurological classifications of different subtypes of the zombie disorder that may give important clues to the etiology of the zombie epidemic. * Truth be told, when we had the opportunity to ask George Romero why he made his ghouls walk they way they did in the Living Dead Movies, he responded “They’re suppose to be dead. They’re stiff. That’s how you’d walk.” Not quite the answer that appeals to our neuroscience instincts, but a good alternative hypotheses to test in the next zombie apocalypse. Check out part of the interview below. As a member of a family that has a number of spinocerebellar ataxia victims, I have to say that your research is either compelling, hilarious, or both. Keep up the good work! Thanks so much Beth. It means a lot to Brad & I when we hear that from patients and their families. It is amusing to know that Zombie is a real condition of brain. Thanks for sharing!